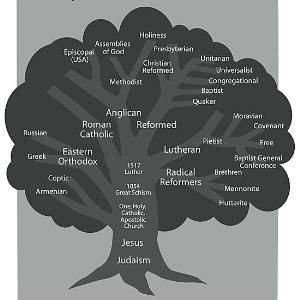 Christians are vastly different from one another. That is one of the issues I had to grapple with in my latest book, Psychology, Religion and Spirituality (published this month by Cambridge University Press). You can’t just lump different kinds of Christians together, because the data is then so ‘noisy’ that you don’t make any progress in research at all. But, so far we have no agreed way of subdividing them. Certain kinds of people are drawn to certain kinds of religion on the basis of personality. But there are some people who are not involved in religion because of personality at all, but because of other social or cultural reasons. They may identify with other religious people, or feel it is what is expected of them, or value some aspect of the religious cultural inheritance, such as the music. These days fewer people go to church services for such reasons than used to be the case. Gone are the days in the 1950s when teenagers would go to church on Sunday evenings to date one another. And the pre-war generation who assumed it was their social duty to make marmalade for the church bring-and-buy, are now almost gone. But a lot of people still visit church buildings, albeit often not for services. They may connect with something religious when they do so. When you come to personality types who are drawn to religion, the research I did for the book led me to think that genetic predisposition provides a helpful approach. Not that there is a really strong predisposition to religion, but religion gets intertwined with other characteristics that are more strongly inherited. I was impressed by how strong the evidence is for a genetic predisposition to conservatism. That often spills over into conservative forms of religion, which is probably now the largest single type of religion. I suspect that religion may often be a spin-off of conservatism, rather than religion making people conservative, but that is hard to prove. Another very different form of religion is experiential. There are some people who are open to a wider range of experiences than most, and that may also have a genetic disposition. It may take people into art or poetry, but it can also take them into a mystical, experiential forms of religion. People with an experiential approach to religion are common among ‘new-agers’, though they often have an uneasy relationship with churches. I suspect that these three forms of religion (cultural, conservative, and experiential) are currently the most important. We badly need some such subdivision. It is a typology that bears some relation to another once-popular categorisation: Extrinsic (cultural), Intrinsic (conservative), and Quest (experiential).